Merry Christmas, grapefriends!!! Thought you’d like a glimpse of the tree I made out of the bottles I drank this year. What a monument to merriment! Just kidding – I found this pic online. Don’t know what wacky grapefriend made this, but I love it! Hope you have a fantastic Christmas full of great wine and even better people to drink it with! Follow along on Twitter and Instagram @grapefriend! 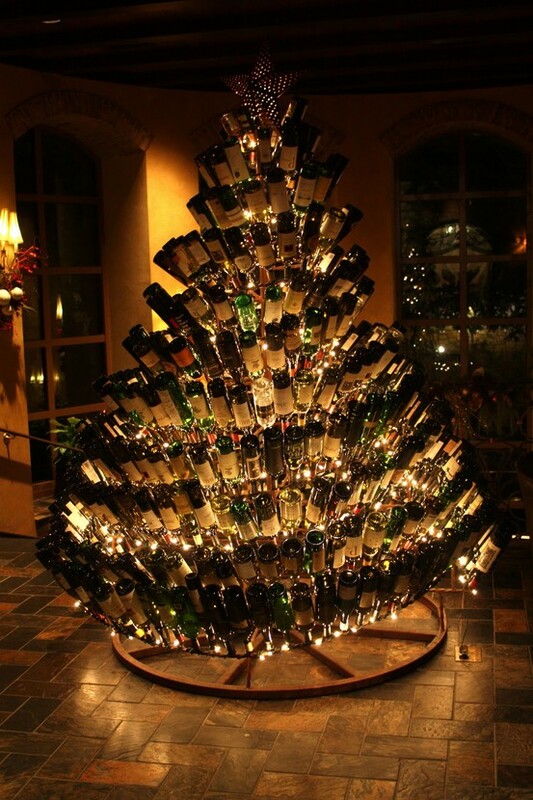 Tags: wine bottle christmas tree. Bookmark the permalink. That’s great, had to reblog, linked of course. Thanks for checking out my blog! The bottle tree, very cool, very terrifying. I have two dogs with big swooshy tails and I see that tree lasting about 5 minutes. I also am very clumsy. Maybe if we surrounded it with a safety fence of some kind? Yes! This is fantastic. I want. From this day forward I will not throw out another wine bottle. Clever decorating idea! Merci, too, for visiting my blog. This is a beautiful tree! I should drink more wine!! We saw a similar tree at the Gaylord in Grapevine Texas…..